The sentencing of 21 men to prison terms ranging from two years to life has sent waves of anger through the majority Shia community in Bahrain. Family members say they have already experienced weeks and months of anxiety about loved ones, to whom they have been given little access. They say the men have been tortured, denied appropriate legal representation, and are now being sentenced harshly for crimes they did not commit in a bid to silence opposition calls for reform. For its part, the government continues to insist - in the face of a growing international outcry - that this trial and others like it are being held in accordance with Bahraini law. In a statement to the BBC it said: "The courts have never been used for the purpose of silencing anyone. "The government believes that the nature of recent incidents and the threat to national security makes the Law of National Safety a legitimate means to prosecute the perpetrators in a court, where they had access to legal counsel and representation, for bringing the country to the brink of total anarchy." But when I phoned her from London, one woman whose husband received a lengthy jail term said: "You just feel hopeless. It's like a movie, a video where everything has been decided in advance. The verdicts were pre-arranged." Another said that the authorities attempted to extract a confession from her husband. The man refused, strengthened in his conviction, she said by the actions of another of the accused, Abdulhadi al-Khawaja. Al-Khawaja, who was sentenced to life in jail, had earlier refused to participate in an attempt by the authorities to videotape a confession. When they threatened him he repeatedly smashed his head against a wall, according to a source close to his family. The harsh sentences come just days ahead of a national dialogue begun by the government - an attempt, it says, to heal the deep wounds caused by sectarian strife. Critics in Bahrain, who fear reprisals if their names are published, say it is the government itself that is most responsible for months of unrest. "The country is divided on sectarian lines more now than ever, and the divisions are getting wider and wider," said one. Another, a journalist says state-controlled television, and a newspaper industry that is now entirely pro-regime, are promoting a steady diet of hate: "It goes like this: Sunnis are the saviours of Bahrain, Shia are the traitors. The media is feeding this sectarian war." That may be true of traditional media outlets, but social media are getting another story out. Twitter in particular paints a picture of harsh repression by government security forces and growing anger in the Shia community. Today the tweets are about how interior ministry police are stopping people from trying to move about freely. A website called Meraate al Bahrain, Bahrain Mirror, is posting material critical of the regime. Against this backdrop of division and anger is the looming deadline of the national unity dialogue, slated for 1 July. On the one hand the regime is offering an apparent path to reconciliation, whilst on the other, it is handing out harsh sentences to those who oppose it - on evidence critics and international observers say is contrived and manufactured. That apparent contradiction reveals the fault line running through the ruling Al Khalifa family, where the crown prince is seen as a moderniser, with his uncle, the prime minister, an unreconstructed hardliner, and his father, the king, somewhere in between. The other hard reality for the regime is the push coming primarily from the United States to ease up on pro-democracy dissidents. That is set against pressure from the Saudis, whose troops remain in Bahrain, not to cave in to what they see as Shia demands. Saudi Arabia's own relationship with its Shia minority, most of whom are in the oil rich eastern province just next door to Bahrain, is at best uneasy. The government says it will press ahead with dialogue. 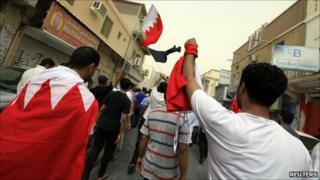 The two key political parties, Waad and Al Wefaq, say they will still participate, despite the latest severe sentences. That is especially surprising perhaps as the leader of Waad, Ibrahim Sharif, was sentenced to five years in jail for attempting to overthrow the very government his party will now sit down with. "The sentences are a travesty and the dialogue is not meaningful," shrugged a party representative, "but we have to show we are positive." But even they were at a loss to explain how dialogue could go forward without the participation of key leaders of the opposition movement.